1500 years BC (3600 years ago) an enormous eruption on the island of Santorin devastated the coast and large parts of the inland of Crete. On Crete we find the oldest and first culture of Europe, the Minoan culture. Some of the people emigrated to the Middle East (Gaza), In the Bible they are referred to as Philistines. (the letters F and P are one letter in both Arabic and Hebrew language). Archaeological excavations show that the pottery is identical to Greek pottery and not to the pottery found in the Middle East. About 700 years BC the Philistines disappear, because they mixed with other peoples, mostly Arab people, but also sometimes with the Jewish people (Samson and Delilah). About 100 years BC the land of Israel is occupied by the Romans. To insult the Jews emperor Hadrian changes the name of Israel into Palestine, referring to this old Greek people that lived on the Gaza strip for about 700 years, more than 800 years ago at that time. The Palestine's from nowadays have nothing to do with the old Philistines. They have an Arab origin. Most of them emigrated to Israel when Jewish emigrants deployed economic activities. Throughout history Jews have always lived in Israel in an independent Jewish state, but often occupied by others. Yasser Arafat was born in Cairo and was an Egyptian who emigrated to Israel to the so called occupied territories that should be handed over to the Arabs (Jew free) while the Arabs already have 21 countries, a territory bigger than Russia. However in Israel 21% of the population of Israel has an Arab origin and live with equal rights in Israel. Take a look at the Palestinian Flag. 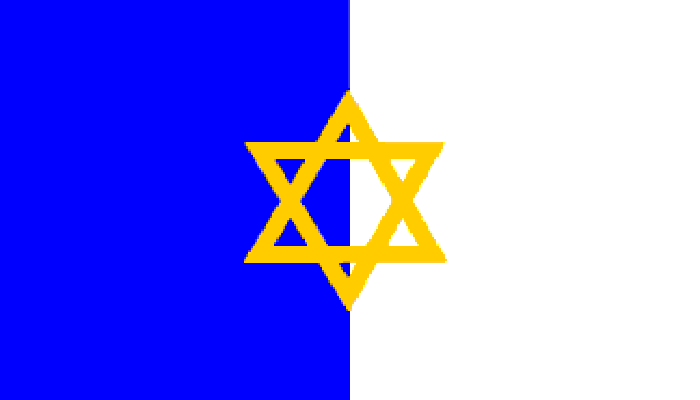 Until 1948 this was the flag of Palestine. Do you really think Palestinians would elect a Jewish Symbol in their Flag?